Objective To quantify the effect of strategies to improve retention in randomised trials. Data sources Sources searched: MEDLINE, EMBASE, PsycINFO, DARE, CENTRAL, CINAHL, C2-SPECTR, ERIC, PreMEDLINE, Cochrane Methodology Register, Current Controlled Trials metaRegister, WHO trials platform, Society for Clinical Trials (SCT) conference proceedings and a survey of all UK clinical trial research units. Review methods Included trials were randomised evaluations of strategies to improve retention embedded within host randomised trials. The primary outcome was retention of trial participants. Data from trials were pooled using the fixed-effect model. Subgroup analyses were used to explore the heterogeneity and to determine whether there were any differences in effect by the type of strategy. Results 38 retention trials were identified. Six broad types of strategies were evaluated. Strategies that increased postal questionnaire responses were: adding, that is, giving a monetary incentive (RR 1.18; 95% CI 1.09 to 1.28) and higher valued incentives (RR 1.12; 95% CI 1.04 to 1.22). Offering a monetary incentive, that is, an incentive given on receipt of a completed questionnaire, also increased electronic questionnaire response (RR 1.25; 95% CI 1.14 to 1.38). The evidence for shorter questionnaires (RR 1.04; 95% CI 1.00 to 1.08) and questionnaires relevant to the disease/condition (RR 1.07; 95% CI 1.01 to 1.14) is less clear. On the basis of the results of single trials, the following strategies appeared effective at increasing questionnaire response: recorded delivery of questionnaires (RR 2.08; 95% CI 1.11 to 3.87); a ‘package’ of postal communication strategies (RR 1.43; 95% CI 1.22 to 1.67) and an open trial design (RR 1.37; 95% CI 1.16 to 1.63). There is no good evidence that the following strategies impact on trial response/retention: adding a non-monetary incentive (RR=1.00; 95% CI 0.98 to 1.02); offering a non-monetary incentive (RR=0.99; 95% CI 0.95 to 1.03); ‘enhanced’ letters (RR=1.01; 95% CI 0.97 to 1.05); monetary incentives compared with offering prize draw entry (RR=1.04; 95% CI 0.91 to 1.19); priority postal delivery (RR=1.02; 95% CI 0.95 to 1.09); behavioural motivational strategies (RR=1.08; 95% CI 0.93 to 1.24); additional reminders to participants (RR=1.03; 95% CI 0.99 to 1.06) and questionnaire question order (RR=1.00, 0.97 to 1.02). Also based on single trials, these strategies do not appear effective: a telephone survey compared with a monetary incentive plus questionnaire (RR=1.08; 95% CI 0.94 to 1.24); offering a charity donation (RR=1.02, 95% CI 0.78 to 1.32); sending sites reminders (RR=0.96; 95% CI 0.83 to 1.11); sending questionnaires early (RR=1.10; 95% CI 0.96 to 1.26); longer and clearer questionnaires (RR=1.01, 0.95 to 1.07) and participant case management by trial assistants (RR=1.00; 95% CI 0.97 to 1.04). Conclusions Most of the trials evaluated questionnaire response rather than ways to improve participants return to site for follow-up. Monetary incentives and offers of monetary incentives increase postal and electronic questionnaire response. Some strategies need further evaluation. Application of these results would depend on trial context and follow-up procedures. This is the most comprehensive review of strategies specifically designed to improve retention in randomised trials, including many unpublished trials and data. Although our searches were extensive, some less well reported, ongoing, or unpublished trials, or trials conducted outside the UK might have been missed. Most of the evidence relates to increasing questionnaire response rather than ways to increase return of participants to sites. Trialists adopt various strategies to try to improve retention and generate maximum data return or compliance to follow-up procedures. These strategies are designed to motivate and keep participants or site clinicians engaged in a trial, but many are untested.4 ,5 A systematic review of strategies to retain participants in cohort studies suggests that providing incentives can improve retention.6 Edwards’ systematic review on methods to increase response rates to postal and electronic questionnaires across a range of study types found that including monetary incentives, keeping the questionnaire short and contacting people before questionnaires were sent were ways to increase response rates.7 However, heterogeneity of effects was an issue and it is unclear which strategies are applicable to randomised trials. Moreover, reasons for loss to follow-up in cohort studies and surveys may differ from randomised trials. In trials, participants may be randomised to a study arm that is not their preferred choice and so strategies that improve retention in other study types cannot necessarily be extrapolated to randomised trials. As loss to follow-up can compromise the validity of findings from randomised trials, delay results and potentially increase trial costs, we conducted a systematic review to assess the effect of strategies to improve retention in randomised trials. We included randomised trials that compared strategies to increase participant retention embedded in ‘host’ randomised trials across disease areas and settings. These strategies should have been designed for use after participants were recruited and randomised. Retention trials embedded in cohort studies and surveys were excluded. We searched MEDLINE (1950 to May 2012), EMBASE (1980 to May 2012), PsycINFO (1806 to May 2012), DARE (to May 2012), Cochrane CENTRAL and CINAHL (1981 to May 2012) using randomised controlled trial filters, where possible, and free text terms for retention (see online supplementary appendix 1 MEDLINE search). C2-SPECTR (to May 2009) and ERIC (1966 to May 2009) were only searched to May 2009 because of difficulties encountered with database and search platform changes. PreMEDLINE was searched to May 2009 but not subsequently because the free text records ultimately appear in MEDLINE. For search updates we also included the Cochrane Methodology Register, Current Controlled Trials metaRegister of Controlled Trials and WHO trials registry. Reference lists of relevant publications, reviews, included studies and abstracts of Society for Clinical Trials meetings from 1980 to 2012 were also reviewed. No language restrictions were applied. All UK clinical trial units were surveyed to identify further eligible trials and the review was advertised at the Society for Clinical Trials Meeting in 2010. Two reviewers (VCB and GR) independently screened potentially eligible trials with disagreements resolved by a third author (SS). Information was sought from investigators to clarify eligibility where this was unclear. Data were extracted for each retention and host trial by one author (VCB) and checked by another (JFT). For retention trials, data were extracted on start time in relation to the host trial, aim, primary outcome, follow-up type, strategy to improve retention and comparator/s, including the frequency and time the strategy was administered, and numbers randomised, included and retained at the primary analysis. Data on sequence generation, allocation concealment, blinding and outcome reporting were extracted for each retention trial to assess risk of bias.9 Data extracted for each host trial were: aim, comparators, primary outcome, disease area and setting. In addition, information on the sequence generation and allocation concealment was extracted to confirm that host trials were randomised. Missing or ambiguous data were queried or obtained through contact with trial authors. Retention was the primary outcome. Most of the retention strategies were applied during follow-up for the host trial. For three host trials, the retention strategy was applied in further follow-up of trial participants after completion. For four host trials, the strategy was applied during the pilot phase, and, for one other host trial, the retention strategy was applied before the host trial started. Where retention trials specified the primary outcome as the retention rate at a particular time point, this was used in the analysis. Where trials reported retention at multiple time points, without specifying which one was the primary outcome, we used the earliest time point in the analysis to see the initial impact on retention or response of introducing the strategy. Where trials reported time to retention, without specifying the primary time point, we used the final time point in the analysis, taking account of any censoring if data were available. For factorial trials13 ,14 that investigated different categories of strategies to improve retention, we included all trial comparisons in the relevant analyses and labelled these accordingly. For one factorial trial,15 where the data were not available to perform this, only the broad trial comparisons (main effects) were included in the analyses. Where there were multiple comparisons in a single trial16 within the same category of strategy, to avoid double counting, the intervention arms were combined and compared with the control arm. Similarly, for three-armed trials17 ,18 that compared two similar intervention arms with one control arm, the intervention arms were combined and compared with the control arm. For these trials, we also compared each intervention arm with the control arm, as separate trial comparisons, in exploratory analyses. Note that these approaches resulted in more trial comparisons than trials. Heterogeneity was examined by the χ2 test, at 0.10 level of significance, and the I2 statistic,19 and explored through subgroup analyses. If there was no substantial heterogeneity, risk ratios were pooled using the fixed-effect model, but if heterogeneity was detected and was not explained by subgroup or sensitivity analyses, we did not pool the results. If heterogeneity could not be explained, we used the random effects model to assess the robustness of the results to the choice of model. To assess the robustness of the results, sensitivity analyses were conducted that excluded quasi-randomised trials. The diversity of trials and interventions identified meant that not all of our prespecified subgroup analyses were appropriate or possible. Therefore, different types of strategies were analysed separately and new subgroups were defined within these strategies prior to analysis. These new analyses are listed in tables 1⇓⇓–4. The absolute benefits of effective retention strategies were based on applying meta-analysis risk ratios to representative control arm retention rates.20 All statistical analyses were conducted using RevMan5. One retention trial was cluster randomised (Land unpublished), four were factorial trials13–16 and there was one three-armed17 and three four-armed trials.18 ,32 Five trials were quasi-randomised,16 ,28 ,29 ,33 allocating participants by either their identification numbers,28 ,29 day of clinic visit16 or by random selection of half the sample for the intervention and half for the control group.33 All strategies targeted individual trial participants except one which targeted sites (Land unpublished). There were 14 retention trials of incentives and 19 trial comparisons. Thirteen trials investigating incentive strategies targeted questionnaire response, with only one targeting participant retention.16 Incentive strategies aimed at improving questionnaire response were: vouchers,18 ,29 ,39 cash,25 a charity donation,18 entry into a prize draw,14 ,18 ,30 cheque17 offers of study results24 ,40 and a certificate of appreciation.15 ,16 Incentive strategies aimed at participant retention were: lapel pins and a certificate of appreciation.16 The UK incentives ranged in value from £5 to £2018 ,29 ,39 (Bailey 1, Baily 2, unpublished) and from $2 to $10 for US-based trials, and were provided as either cash or voucher. Offers of entry into prize draws ranged from £25 to £250 for UK18 ,30 and US$50 for US-based trials14 (table 1); there was no information available on the chance of winning a prize. One trial evaluated giving a monetary incentive with a promise of a further incentive for return of trial data (Bailey 2 unpublished). There were 14 retention trials of communication strategies and 20 trial comparisons. Most of the communication strategies targeted questionnaire response, with only one targeted at the return of biomedical test kits.35 Strategies evaluated were: enhanced letters, that is, those with additional information about trial processes or with an extra feature, for example, signed by a principal investigator15 (Marson unpublished), use of additional telephone reminders35 (Maclennan unpublished), a calendar including reminders of when to return a questionnaire34, text and/or email reminders21 ,31 ,35 and reminders to sites of upcoming assessments versus no additional reminder (Land unpublished). One trial used a package of postal communication strategies called the Total Design Method (TDM)37 and another used recorded delivery of questionnaires38 (table 2). The effect of a change in questionnaire format on response to questionnaires was evaluated in eight trials. The 10 comparison formats evaluated were (table 3): questionnaire length27 ,32 ,36 (Edwards unpublished Svoboda unpublished), order of questions (Letley unpublished33) and relevance of questionnaires in the context of research in alcohol dependence32. There were two retention trials of motivational behavioural strategies, one in an exercise trial26 and another in a parenting trial23 (table 4). A behavioural strategy was defined as giving participants information about goal setting and time management to facilitate successful trial completion. One retention trial was run prior to the host trial,23 where only participants who completed the orientation/retention trial were included in the subsequent parenting trial. Case management defined as outreach, service planning linkage, monitoring and advocacy was compared with usual follow-up in a cancer screening trial28 (table 4). This strategy involved trial assistants managing participant follow-up by arranging services to enable participants to keep trial follow-up appointments. One trial included an open trial versus blind trial design to evaluate the impact on questionnaire response22 (table 4). Two included trials could not be included in the meta-analysis30 (Letley unpublished). For one trial, the host trial participants included randomised and non-randomised participants30 and the author confirmed that the participants in the retention trial were from both cohorts and these data could not be separated. For the other trial, retention trial outcome data were not available (Letley unpublished). Twenty-four trials describe adequate sequence generation15 ,16 ,18 ,22–24 ,26 ,30–32 ,34 ,35 ,37 ,39 ,40 (unpublished trials Bailey 1, Bailey 2, Letley, Land, Maclennan, Marson). There was insufficient information about the sequence generation for 10 trials, but they were all described as randomised13 ,14 ,17 ,21 ,25 ,27 ,36 ,38 (Edwards, Svoboda unpublished). Five trials used quasi-randomisation.16 ,28 ,29 ,33 Fifteen trials reported adequate sequence generation and allocation concealment18 ,22 ,24 ,26 ,31 ,32 ,34 ,39 ,40 (Letley, Maclennan, Bailey 1, Bailey 2, unpublished). Blinding of participants to the intervention was not possible for incentive strategies, offers of incentives, behavioural or case management strategies and different types of communication and questionnaire format strategies. For one trial that evaluated the effect of a blind versus open design on retention this was not applicable.22 For some trials, participants were aware of the intervention but unaware of the evaluation14 ,16 ,23 ,30 ,33 ,39 (Maclennan, Marson unpublished). For another trial,26 exercise sessions were not separated according to the behavioural intervention, that is, walking and swimming, and potential contamination between groups could have led to bias. For other trials, blinding of participants or trial personnel to the outcome or intervention was not reported. The primary outcome measure for this review was retention, and this was well reported. Authors were contacted for clarification of any exclusions after randomisation if this was unclear from retention trial reports. Although retention trial protocols were not available for included trials, the published and unpublished reports included reported all expected outcomes for retention. There were 14 retention trials of incentives, 19 trial comparisons with 16 253 comparisons. Across incentive subgroups, there was considerable heterogeneity (p<0.00001; figure 1A). So we did not pool the results for incentives. Unless otherwise stated, results from the random effects model were similar. Three trials (3166 participants) that evaluated the effect of giving monetary incentives to participants showed that the addition of monetary incentives is more effective than no incentive at increasing response to postal questionnaires (RR=1.18; 95% CI 1.09 to 1.28; p<0.0001, heterogeneity p=0.21; figure 1A). A sensitivity analysis excluding the quasi-randomised trial by Gates et al29 shows a similar effect (RR=1.31; 95% CI 1.11 to 1.55; p=0.002). Also, based on two web-based trials (3613 participants, figure 1A), an offer of a monetary incentive promotes greater return of electronic questionnaires than no offer (RR=1.25; 95% CI 1.14 to 1.38, p<0.00001, heterogeneity p=0.14). However, a single trial comparison suggests that an offer of a monetary donation to charity does not increase response to electronic questionnaires (RR=1.02, 95% CI 0.78 to 1.32; p=0.90; figure 1A). (A) Incentive strategies: main analysis addition of incentive versus no incentive, (B) incentives: addition of £20 vs £10 incentive, (C) incentives addition of: monetary incentive versus offer of entry into prize draw. On the basis of three trials (6322 participants), there is no clear evidence that the addition of non-monetary incentives improved questionnaire response (RR=1.00; 95% CI 0.98 to 1.02; p=0.91) but there is some heterogeneity (p=0.02; figure 1A). A sensitivity analysis excluding the quasi-randomised trial by Bowen et al16 showed a similar effect (RR=1.00; 95% CI 0.93 to 1.08; p=0.99, heterogeneity p=0.01). Two trials (1138 participants) evaluating offers of non-monetary incentives suggest that an offer of a non-monetary incentive is neither more nor less effective than no offer (RR=0.99; 95% CI 0.95 to 1.03; p=0.60; heterogeneity p=0.52) at improving questionnaire response (figure 1A). In exploratory analyses, the different incentive arms that were combined for the main analysis do not appear to show differential effects (see online supplementary figure S5). Two trials (902 participants) show that higher value incentives are better at increasing response to postal questionnaires than lower value incentives (RR 1.12; 95% CI 1.04 to 1.22; p=0.005; heterogeneity p=0.39) irrespective of how they are given (figure 1B). 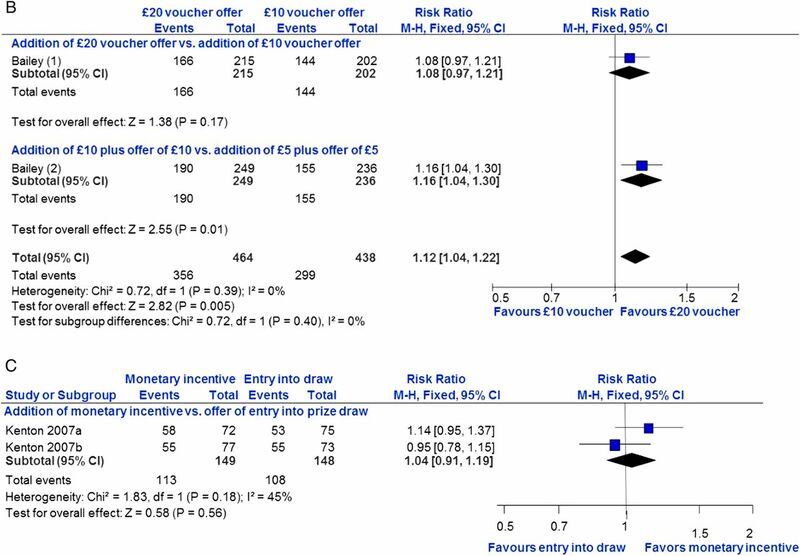 Two trial comparisons (297 participants) provide no clear evidence that giving a monetary incentive is better than an offer of entry into a prize draw for improving response to postal questionnaires (RR=1.04; 95% CI 0.91 to 1.19; p=0.56, heterogeneity p=0.18; figure 1C). One trial could not be included in the analysis,30 but showed a higher response in the group offered entry into a prize draw (70.5%) compared with the group not offered entry into the draw (65.8%). There were 14 trials of communication strategies and 20 comparisons with 9822 participants. The communication strategies were so diverse that these were analysed separately. Results from two trials (2479 participants) show that an enhanced letter is neither more nor less effective than a standard letter for increasing response to postal questionnaires (RR=1.01; 95% CI 0.97 to 1.05; p=0.70; heterogeneity p=0.80; figure 2A). Although based on a single trial (226 participants), the TDM package seems much more effective than a customary postal communication method at increasing questionnaire return (RR=1.43, 95% CI 1.22 to 1.67; p<0.0001; figure 2B). Based on the relevant arms of three trials (1888 participants), there is no clear evidence that priority post is either more or less effective than regular post at increasing trial questionnaire return (RR=1.02; 95% CI 0.95 to 1.09; p=0.55; heterogeneity p=0.53; figure 2C). Communication strategies: (A) enhanced versus standard letter, (B) total design versus customary post, (C) priority versus regular post, (D) additional reminders to participants versus usual follow-up, (E) telephone survey versus monetary incentive and questionnaire. Six trials (3401 participants) evaluated the effect of different types of reminders to participants on questionnaire response. There is no clear evidence that a reminder is either more or less effective than no reminder (RR=1.03; 95% CI 0.99 to 1.06; p=0.13; heterogeneity p=0.73) at improving trial questionnaire response (figure 2D). One trial (700 participants) showed no clear evidence that a telephone survey is either more or less effective than a monetary incentive and a questionnaire for improving questionnaire response (RR=1.08; 95% CI 0.94 to 1.24; p=0.27; figure 2E). Based on one cluster randomised trial (272 participants), a monthly reminder to sites of upcoming assessment was neither more nor less effective than the usual follow-up (RR=0.96; 95% CI 0.83 to 1.11; p=0.57). However, one small trial (192 participants) suggested that recorded delivery is more effective than a telephone reminder (RR=2.08; 95% CI 1.11 to 3.87; p=0.02). Based on one other trial (664 participants), there is no clear evidence that sending questionnaires early increased or decreased response (RR=1.10; 95% CI 0.96 to 1.26; p=0.19). Eight trials with 10 comparisons (21 505 participants) evaluated the effect of a new questionnaire format on questionnaire response. Although there is only some heterogeneity between the questionnaire subgroups (p=0.11; figure 3), it did not seem reasonable to pool the results based on such different interventions. Questionnaires: new format versus standard format. Five trials (7277 participants) compared the effect of short versus long questionnaires on postal questionnaire response. There is only a suggestion that short questionnaires may be better (RR=1.04; 95% CI 1.00 to 1.08; p=0.07, heterogeneity p=0.14; figure 3). Based on one trial (900 participants), there is no clear evidence that long and clear questionnaires are more or less effective than shorter condensed questionnaires for increasing questionnaire response (RR=1.01, 0.95–1.07; p=0.86; figure 3). 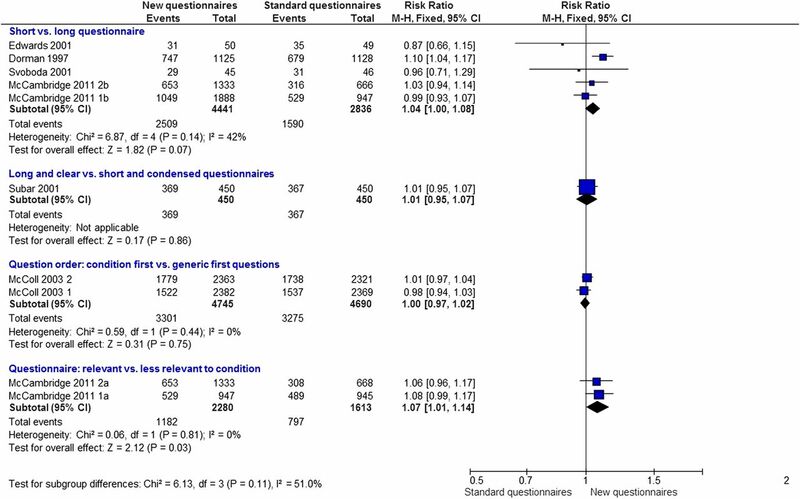 Two quasi-randomised trials (9435 participants) also show no good evidence that placing disease/condition questions before generic questions is either more or less effective than vice versa at increasing questionnaire response (RR=1.00, 0.97–1.02; p=0.75, heterogeneity p=0.44; figure 3). One trial by Letley (unpublished), not included in this analysis, provided no estimate of effect. In the context of research on reducing alcohol consumption, there is also evidence that more relevant questionnaires, that is, those relating to alcohol use, increase response rates (RR 1.07; 95% CI 1.01 to 1.14; p=0.03, figure 3). Two community-based trials (273 participants) show no clear evidence that the behavioural/motivational strategies used are either more or less effective than standard information for retaining participants (RR=1.08; 95% CI 0.93 to 1.24; p=0.31, heterogeneity p=0.93). One trial (703 participants) evaluated the effect of intensive case management procedures on retention. There is no evidence that intensive case management is either more or less effective than usual follow-up in the population examined (RR=1.00; 95% CI 0.97 to 1.04; p=0.99). One fracture prevention trial (538 participants) evaluated the effect of participants knowing their treatment allocation (open trial) compared with participants blind/unaware of their allocation on questionnaire response. The open design led to higher response rates (RR=1.37; 95% CI 1.16 to 1.63; p=0.0003). The absolute benefits of effective strategies on typical questionnaire response are illustrated in table 5. Based on a 40% baseline response rate for postal questionnaires, the addition of a monetary incentive is estimated to increase response by 92 questionnaires/1000 sent (95% CI 50 to 131). With a baseline response rate of 30%, as seen in the included online trial, the addition of an offer of a monetary incentive is estimated to increase response by 140 questionnaires/1000 sent (95% CI 86 to 193). Thirty-eight randomised retention trials were included in this review, evaluating six broad types of strategies to increase questionnaire response and retention in randomised trials. Trials were conducted across a spectrum of disease areas, countries, healthcare and community settings (tables 1⇑⇑–4). Strategies with the clearest impact on questionnaire response were: addition of monetary incentives compared with no incentive for return of postal questionnaires, addition of an offer of a monetary incentive when compared with none for return of electronic questionnaires and an offer of £20 vouchers when compared with £10 for return of postal questionnaires and biomedical test kits. The evidence was less clear about the effect of shorter questionnaires rather than longer questionnaires and for questionnaires of greater relevance to the questions being studied. Recorded delivery of questionnaires, the TDM, a ‘package’ of postal communication strategies with reminder letters and an open trial design appear more effective than standard procedures. These strategies were tested in single trials and may need further evaluation. The addition of a non-monetary incentive or an offer of a non-monetary incentive compared with no incentive did not increase or decrease trial questionnaire response. ‘Enhanced’ letters, letters delivered by priority post or additional reminders were also no more effective than standard communication. Altering questionnaire structure does not seem to increase response. No strategy had a clear impact on increasing the number of participants returning to sites for follow-up. This is the most comprehensive review of strategies specifically designed to improve retention in randomised trials, including many unpublished trials and data. Although our searches were extensive, some less well-reported, ongoing, or unpublished trials, or trials conducted outside the UK might have been missed. Most of the trials used appropriate methods for randomisation or at least stated that they were randomised. For trials that did not describe their methods well or provide further information, there remains a potential risk of selection bias. Sensitivity analyses excluding quasi-randomised trials did not affect the results. In this context, where motivating participants to provide data or attend clinics is often the target of the interventions and so appropriately influences the outcome; lack of blinding is less of a concern. Retention is the outcome and was obtained for all but two trials therefore, attrition and selective outcome reporting bias are probably unimportant. Although the retention trials were fairly well conducted, this could be improved, and they were often poorly reported. This may be because they were designed when loss to follow-up became a problem in a trial, rather than pre-planned prior to the start of the host trial. Few trials are available for behavioural, case management and methodological strategies (only 1 or 2 each) and this affects the power of the result for these strategies. The use of open trials to increase questionnaire response can only be applied to trials where blinding is not required; based on our result, this strategy would need to be evaluated in different trial contexts if it were to be applied in other areas. All included trials were conducted in higher income countries. Therefore, the effective strategies may not be socially, culturally or economically appropriate to trials conducted in low-resource settings. The diversity of strategies and the low number of trials meant that we could not examine the impact of, for example, trial setting and disease area as planned. Moreover, most of the evidence relates to increasing questionnaire response rather than participant retention in follow-up. Many trials require participants to return to sites for follow-up and monitoring; however, barriers to follow-up do exist and are trial and participant specific depending on the disease area, treatment and population group. Return for follow-up at sites depends on participant preferences and the demands of the trial.42 Barriers to follow-up at site could be alleviated by using tailored strategies to encourage participants to return to sites for follow-up and monitoring. Studies that evaluate such strategies are particularly needed. Prior to our review, it was not clear which, if any, of these strategies could be extrapolated to randomised trials. We also identified additional strategies that may improve trial questionnaire response or retention, for example, methodological strategies. Although giving monetary incentives upfront seems effective, offering and giving these after receipt of data could be a cost-effective strategy, because those not returning questionnaires would not receive an incentive. The addition of non-monetary incentives, for example, lapel pins and certificates of appreciation, or offers of these, did not increase response or retention, perhaps because these items are not valued by participants. Offers of monetary incentives were also an effective strategy in the context of an online electronic questionnaire, thus, it would be beneficial for trialists to know which is more effective: an offer of a monetary incentive or an upfront monetary incentive in a head-to-head trial comparison. The value of incentives used in the UK evaluations ranged from GBP5 to GBP20 and for US-based studies was US$2 to US$10. For offers of entries into prize draws, the values were higher, ranging from GBP25 to GBP250 for the UK prize draws and US$50 for US-based prize draws. The value of monetary incentive should not be so high as to be perceived as payment or coercion for data but more as an appreciation for efforts made by participants. A cost-effectiveness analysis for additional responses gained after incentive strategies were introduced was reported for only some incentive trials.18 ,25 ,29 ,30 ,39 As costs increase the cost-benefit associated with incentive strategies would need to be updated if incentives were to be used to improve retention in future trials. Priority post, enhanced letters (eg, signed by the principal investigator) and different types of additional reminders are used by trialists in current research practice, but these were not found to be effective. The former may not be considered important and too many reminders, over and above standard procedures, could be counterproductive. Although appearing very effective, the TDM for postal questionnaires could be labour-intensive to implement, expensive and may no longer be applicable to some participant groups, for example, young people used to other modes of communication, or in trials using email, text or online data collection. Recorded delivery could be useful to ensure trial follow-up supplies to reach their intended destination, but careful planning to avoid inconvenience for the participant might be necessary. Open trials to increase questionnaire response can only be used where blinding is not required. This could be counterproductive, however, as unblinded trials can cause biased outcome assessment or loss to follow-up if a participant or clinician has a treatment preference. Questionnaire length and relevance may need further evaluation as there is only a suggestion that these are effective in the context of randomised trials. Also, telephone follow-up compared with a monetary incentive sent with a questionnaire needs further evaluation possibly with a cost-benefit analysis as both could be expensive in time and human resources. Evaluations of strategies that encourage participants to return to sites for follow-up visits and monitoring are particularly needed because many trials collect outcome data in this way. Trialists should consider including well thought out and adequately powered evaluations of strategies to increase retention in randomised trials with clear definitions of retention strategies and retention measures. Trialists could incorporate evaluations of strategies to improve retention at the design stage so that power, sample size and funding are taken into account. Retention trials were often poorly reported and trialists should adhere to the consort guidelines for trial reporting to facilitate the synthesis of results in future methodology reviews. There is less research on ways to increase return of participants to trial sites for follow-up and on the effectiveness of strategies to retain trial sites in cluster and individual randomised trials. Research in both areas would be very beneficial to trialists. Application of the results of this review would depend on trial setting, population, disease area, budget allowance and follow-up procedures. Trialists should consider using monetary incentives and offers of monetary incentives to increase postal and electronic questionnaire response, depending on trial setting, population, disease area, budget and usual follow-up procedures. Future evaluations of retention strategies in randomised trials should be carefully planned and adequately powered, and the retention strategies and measures of retention should be clearly defined. More research on ways to increase return of participants to sites for follow-up and on ways to retain sites in cluster and individual randomised trials are also needed. The authors would like to thank the following: all authors of included published trials for providing extra unreported data; principal investigators for data on trials in progress or completed and unpublished (Julia Bailey UCL for data for Bailey 1 and Bailey 2; Graeme MacLennan for data for MacLennan; Stephanie Land data for Land) and the coordinators of the UK Clinical Trials Units who responded to our survey with information about ongoing and/or unpublished completed trials. The authors also thank Cara Booker, SPHRU, for search strategy information; Angela Young, Librarian UCL, for assistance with searching databases and Ian White, MRC Bio Statistics Unit Cambridge, for helpful comments on the analysis of multiarm trials. They also acknowledge Shaun Treweek, Mike Clarke, Andy Oxman, Karen Robinson and Anne Eisinga for comments on the review protocol; and Phil Edwards, Elie Akl, Lisa Maguire, Jean Suvan, Shaun Treweek, Mike Clarke and Karen Robinson for comments on the review.
. How much loss to follow-up is acceptable in long-term randomised trials and prospective studies? Arch Dis Child 2008;93:458–61.
. Sample size slippages in randomised trials: exclusions and the lost and wayward. Lancet 2002; 359:781–5.
. What is meant by intention to treat analysis? Survey of published randomised controlled trials. BMJ 1999;319:670–4.
. Systematic review identifies number of strategies important for retaining study participants. J Clin Epidemiol 2007;60:757.
. Maximizing retention in community-based clinical trials. J Nurs Scholarsh 2002;34:47–53.
. A systematic review of the effect of retention methods in population-based cohort studies. BMC Public Health 2011;11:249.
. Methods to increase response rates to postal and electronic questionnaires. Cochrane Database Syst Rev 2009;(3):MR000008.
. Strategies to reduce attrition in randomised trials. 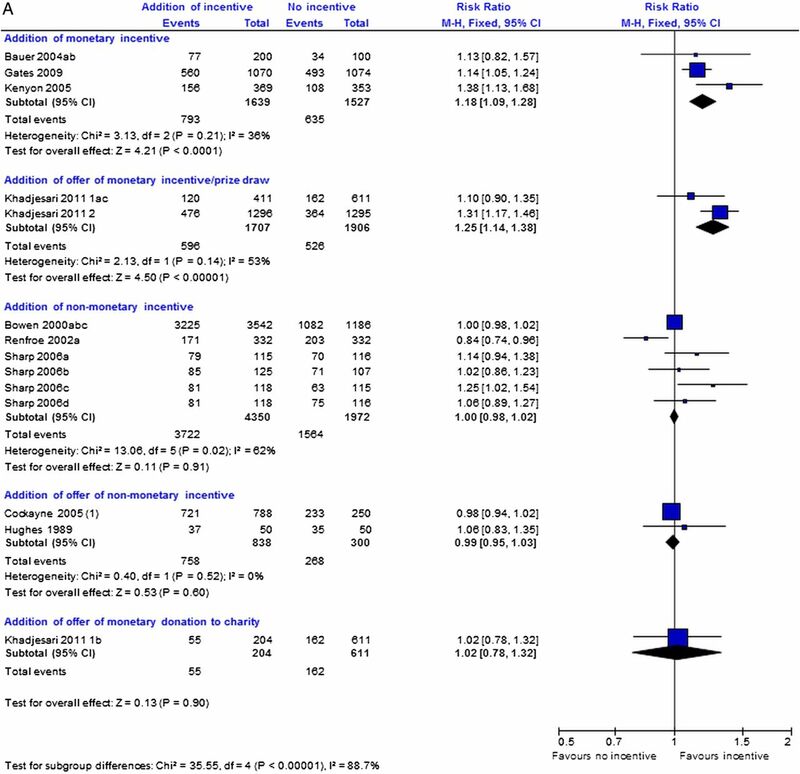 Cochrane Database Syst Rev 2011;(2):MR000032.
. Assessing risk of bias in included studies. In: Higgins J, Green S. eds. Cochrane hanbook for systematic reviews of interventions. John Wiley, 2008:187–242.
. Special topics in statistics. In: Higgins JPT, Green S. eds. Cochrane handbook for systematic reviews of intervenions. John Wiley, 2008:482–529. University of Aberdeen. Aberdeen ICCs. 2013. Ref Type: Online Source. http://www.abdn.ac.uk/hsru/research/delivery/behaviour/methodological-research/.
. Strategies to improve retention in randomised trials. Cochrane Database Syst Rev 2013(12):MR000032.
. Enclosing a pen with a postal questionnaire can significantly increase the response rate. J Clin Epidemiol 2006;59:747–54.
. Abstracts from the 28th Meeting of the Society of Clinical Trials, Montreal, May 20−23, 2007: the effect of incentives and high priority mailing on postal questionnaire response rates: A Mini-RCT. Clinical Trials 2007;4:371–455.
. The end-of-study patient survey: methods influencing response rate in the AVID Trial. Control Clin Trials 2002;23:521–33.
. Effects of incentive items on participation in a randomized chemoprevention trial. J Health Psychol 2000;5:109–15.
. Obtaining DNA from a geographically dispersed cohort of current and former smokers: use of mail-based mouthwash collection and monetary incentives. Nicotine Tob Res 2004;6:439–46.
. Impact and costs of incentives to reduce attrition in online trials: two randomised controlled trials. J Med Internet Res 2011;13:e26.
. Interpreting results and drawing conclusions. In: Higgens J, Green S. eds. Cochrane handbook for systematic reviews of interventions. Chichester West Sussex: John Wiley and Sons Ltd, 2008:359–87.
. A randomized trial of electronic reminders showed a reduction in the time to respond to postal questionnaires. J Clin Epidemiol 2011;64:208–12.
. A motivational intervention can improve retention in PCIT for low-motivation child welfare clients. Child Maltreat 2009;14:356–68.
. A randomised controlled trial to assess the effectiveness of offering study results as an incentive to increase response rates to postal questionnaires [ISRCTN26118436]. BMC Med Res Methodol 2005;5:34.
. Following up nonrespondents to an online weight management intervention: randomized trial comparing mail versus telephone. J Med Internet Res 2007;9:e16.
. Short and long-term adherence to swimming and walking programs in older women—The Sedentary Women Exercise Adherence Trial (SWEAT 2). Prev Med 2008;46:511–17.
. A randomised comparison of the EuroQol and Short Form-36 after stroke. United Kingdom collaborators in the International Stroke Trial. BMJ 1997;315:461.
. Enhancing adherence among older African American men enrolled in a longitudinal cancer screening trial. Gerontologist 2006;46:545–50.
. Does a monetary incentive improve the response to a postal questionnaire in a randomised controlled trial? The MINT incentive study. Trials 2009;10:44.
. Cost effectiveness of a prize draw on response to a postal questionnaire: results of a randomised trial among orthopaedic outpatients in Edinburgh. J Epidemiol Public Health 1997;51:463–4.
. Electronic reminders did not improve postal questionnaire response rates or response times: a randomized controlled trial. J Clin Epidemiol 2011;64:1001–4.
. Impact of length or relevance of questionnaires on attrition in online trials: randomized controlled trial. J Med Internet Res 2011;13:e96.
. From the Generic to the Condition-specific? : instrument order effects in quality of life assessment. [Article]. Med Care 2003;41:777–90.
. A study of response and non-response to postal questionnaire follow-up in clinical trials. Chapter 6: a radomised controlled trial of a method of improving response to postal questionnaire follow-up in a clinical trial. University of Warwick, 2007.
. Two controlled trials to increase participant retention in a randomized controlled trial of mobile phone-based smoking cessation support in the United Kingdom. 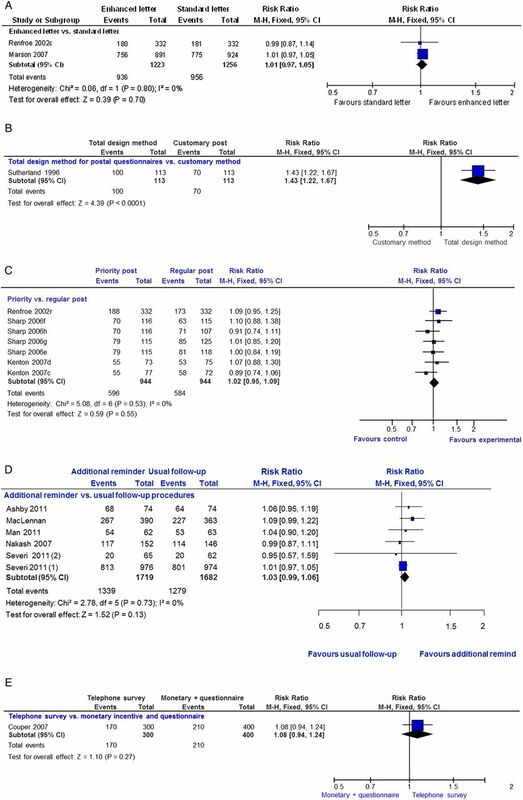 Clin Trials 2011;8:654–60.
. Is shorter always better? Relative importance of questionnaire length and cognitive ease on response rates and data quality for two dietary questionnaires. Am J Epidemiol 2001;153:404–9.
. A randomized trial of the total design method for the postal follow-up of women in a cancer prevention trial. Eur J Cancer Prev 1996;5:165–8.
. A randomized trial of the impact of telephone and recorded delivery reminders on the response rate to research questionnaires. J Public Health 1997;19:219–21.
. The effect of a monetary incentive on return of a postal health and development questionnaire: a randomised trial [ISRCTN53994660]. BMC Health Serv Res 2005;5:55. Hughes JFR. Free reprints to increase the return of follow-up questionnaires. Abstracts from the Tenth Meeting of the Society of Clinical Trials, 15–18 May 1989; Minneapolis. 1989;10:316–54.
. A randomised controlled trial examining the longer-term outcomes of standard versus new antiepileptic drugs The SANAD trial. NIHR HTA Report, 2007;11.
. Barriers to participation in randomised controlled trials: a systematic review. J Clin Epidemiol 1999;52:1143–56. Contributors VCB wrote the protocol for the review with comments from JFT, GR, SS, SM, IN and SH. JFT and VCB designed the searches with comments from SH. VCB conducted the searches, screened all abstracts, and full articles of potentially eligible trials. VCB and GR screened potentially eligible trial articles. SS acted as a third reviewer. Data extraction was conducted by VCB and checked by JT. JT designed the analysis plan with VCB. VCB conducted the analysis with advice on interpretation of results from JFT, SS, IN and GR. VCB wrote the first draft of the review with critical comments from all authors. Funding This project was funded by the Medical Research Council Population Health Sciences Research Network grant number PHSRN 30.